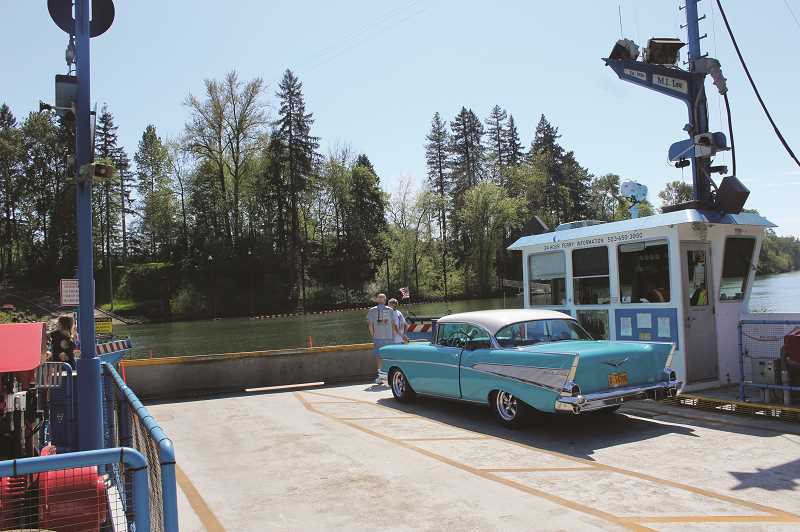 The County continues to move the Canby Ferry feasibility study toward completion. The responses from more than 250 people attending the first open house in June are now compiled. It's a complicated study to look at the six or seven different pieces within the study, including cost analysis for the ferry, cost analyses for the bridge, toll rates and the assessment of steps leading to the final report. "We have a number of pieces to make up for the final study report," said Stephen Williams, project manager. The study is considering continuing or discontinuing ferry service, building a new bridge without tolls but with or without ferry service and building a toll bridge with or without ferry service. In the coming months, on Oct. 2, the consultant team will present its final information in a status report to study members. Study members then will schedule a second open house during the second week of November. The final report will go to the Clackamas County Board of Commissioners between the second open house and Thanksgiving. "I know there's a lot of interest in what's going on and what we are doing. Right now the study is ongoing and on track," Williams said. The report to the County Commissioners will depend on how they want to schedule it, but definitely between the second open house and Thanksgiving, he added. The County began the study to determine whether the ferry is still feasible because it's limited to the number of people that are able to cross and uses money the county commissioners wonder would be better spent on road maintenance. The first open house was held in June to inform people regarding the project and to gather information. First on the list to study was a feasibility study overview, ferry facts, a bridge concept, a traffic analysis and toll rates. They have and will continue to study financial factors, potential traffic impacts and related factors reporting these at the second open house. No action will be taken without additional public input, according to the feasibility website. Checking into cost estimates for future operations of the ferry and potential bridges is one of the more important aspects of the study. Study members are looking at operations, maintenance and capital costs for the ferry or the alternative costs of discontinuing the ferry. They also will look to the development, construction and maintenance for a bridge as well as conceptual plan and elevations for two bridge conceptions at the location of the ferry to extend from the north side top of the bluff to the south side. Bridge concepts will be selected to provide low and high figures for costs and environmental impacts. Early on in the study, Williams noted that even if the County Commissioners decide to discontinue the ferry, it still will take time to plan and build a new bridge. Also under cost elements are operating costs for manual, transponder and optical character recognition toll collection. These will include identifying facility requirements and associated costs, information system requirements, staff/vendors and annual operating and administrative costs. The study also will identify road improvements to accommodate increased traffic and estimated costs for improvements. Study members plan to look into revenue and traffic for each of the six ideas. Most complex is the future traffic on the toll bridge with various amounts to identify the relationship between cost and traffic. It will include future traffic given congestion on I-5 and I-205. Another segment will be total annual costs where the study estimates costs for the operation and maintenance of the ferry including capital rehabilitation and replacement. It also will look at a 30-year bonding cost analysis combining capital improvement costs for the bridge and associated facilities that include annual debt service, financing costs, annual contribution to capital reserves and increased costs for roadway operations and maintenance. Another area to picture is the 30-year annual cost analysis for the toll collection system that will include system operations, staffing, operations and maintenance. This will be conducted for manual, electronic (transponder) and photo toll collections. The study also will analyze roads and intersections surrounding the bridge that will experience increased traffic and higher estimated costs for annual maintenance. It will study the annual revenue minus annual costs for each of the six alternatives. The study's final issue is to develop an outline of the steps necessary to develop a bridge and implement tolls including those tolls from local governments under Oregon Revised Statutes, environmental review and permitting by state and federal authorities. The June Feasibility Study received a number of divergent answers to questions for feedback. For example, 40 people stated they utilize the ferry a few times a year, 20 people said they ride it twice a week or more and only one said they use it daily. Most, 65, answered they ride it for recreation, 43 for shopping, 21 for work and 29 to visit family and friends. Most people indicated they weren't too excited about a bridge, with 26 people stating they'd never use it and another 26 indicating they'd use it twice a week or more. People had different reasons for potentially taking the bridge. The most popular, 50 people, said they'd use it for shopping, 46 for recreation, 26 to visit family or friends and 25 for work. One suggested they would take it only if I-5 were closed. Ninety-two said no to the bridge, and 51 suggested keeping the ferry, while 14 said if it's not affordable shut it down; only six liked the idea of a toll bridge while six others suggested building the bridge without specifying the type. Eight people suggested adding a bridge/improvements somewhere else.